Arthur Boyd’s legacy is a collection of masterpieces that define the history of Australian art in the last century. But the man himself-enigmatic, inarticulate, modest-has remained in the shadows until now. Based on over six years of meticulous research and hundreds of interviews, Darleen Bungey sweeps us into the intimate circle of one of Australia’s most fascinating families. Arthur Boyd emerges as a passionate, dramatic figure whose self-effacing demeanour cloacked a strong personality that refused to allow his turbulent and sometimes tragic personal life to interfere with his creative genius. From Victoria’s bohemian enclaves to the heady swirl of Melbourne and London in the years of artistic and social revolution, to the rural removes of Suffolk and the Shoalhaven, this is a journey into the mind and heart of a complex man whose absolute commitment to his art thrust aside personal adversity in the relentless pursuit of his work. There are art books and there are biographies. 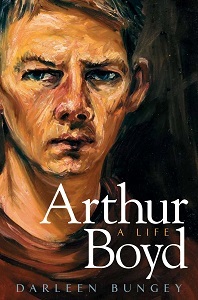 Arthur Boyd: A Life is rare – a revelation of an artist’s life as compelling as the writing about his art. Originally a copywriter in Australian, American and UK advertising, Darleen Bungey worked as an associate editor and freelance journalist for a number of prestigious British-based magazines while she raised a family in London. In 1999 she began researching and writing a biography of Arthur Boyd, both for publication and as a doctorate. This is her first book.